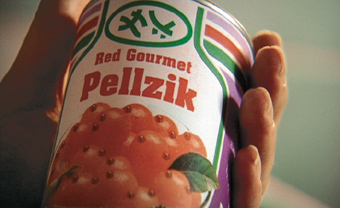 Scene from "Red Gourmet Pellzik"
Andreas Samland , born in 1974, has worked as a 3D designer for several PlayStation and PC video games in Germany and the UK. Since 1999, he has been a student at the German Film & Television Academy (dffb) in Berlin. His films include Der neue Hit (2000), Red Gourmet Pellzik (2001), Tag 26 (2002), The Dud (Der Blindgaenger, 2004), and The Date (2005).